Go to original pattern for design DROPS 186-39. Knitted jacket with stripes, lace pattern and shawl collar. Size: S - XXXL Piece can be worked in 2 strands DROPS Brushed Alpaca Silk or 1 strand DROPS Melody. 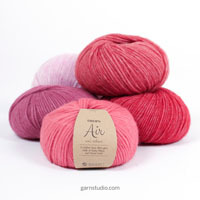 NOTE: If the garment is made in only 1 colour, it requires 300-300-350375-400-450 g Brushed Alpaca Silk. NOTE: If the garment is made in only 1 colour, it requires 300-300-350375-400-450 g Melody. 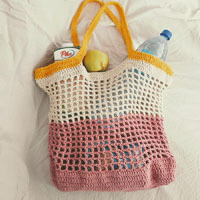 “Alternative yarn (yarn group D)” - see link below. 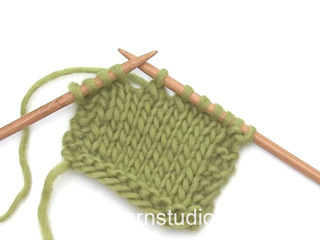 DROPS DOUBLE POINTED NEEDLES AND CIRCULAR NEEDLE (40 and 80 cm) SIZE 8 mm – or size needed to get 12 stitches and 14 rows in stocking stitch with 2 strands Brushed Alpaca Silk or 1 strand Melody = width 10 cm and 10 cm vertically. DROPS DOUBLE POINTED NEEDLES AND CIRCULAR NEEDLE (80 cm) SIZE 7 mm – or size needed to get 13 stitches and 15 rows in stocking stitch with 2 strands Brushed Alpaca Silk or 1 strand Melody = width 10 cm and 10 cm vertically. ACCESSORIES: 2 wooden beads (10 mm) - for ties. 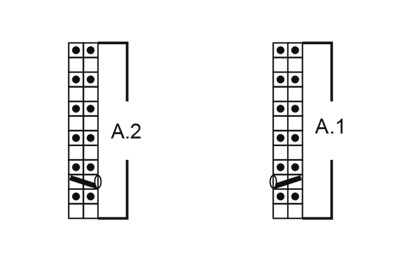 See diagrams A.1 and A.2. Diagrams show all rows in pattern seen from the right side. Repeat A.1 and A.2 vertically (= 12 rows). STRIPE 1: Work 26-27-28-29-30-31 cm with 2 strands light grey Brushed Alpaca Silk or 1 strand pearl grey Melody. STRIPE 2: Work 26-27-28-29-30-31 cm with 2 strands light sea green Brushed Alpaca Silk or 1 strand light sea green Melody. Then work with 2 strands off white Brushed Alpaca Silk or 1 strand off white Melody until finished measurements. STRIPE 1: Work 3½-3½-3½-3-3-3 cm with 2 strands light sea green Brushed Alpaca Silk or 1 strand light sea green Melody. STRIPE 2: Work 3½-3½-3½-3-3-3 cm with 2 strands light grey Brushed Alpaca Silk or 1 strand pearl grey Melody. STRIPE 3: Work 3½-3½-3½-3-3-3 cm with 2 strands off white Brushed Alpaca Silk or 1 strand off white Melody. Repeat stripes 1-3 2 more times, then repeat stripe 1 1 more time. Then work with 2 strands light grey Brushed Alpaca Silk or 1 strand pearl grey Melody until finished measurements. Begin 3 stitches before marker thread: Knit 2 stitches together, knit 2 (marker thread is between these stitches), slip 1 stitch knitwise, knit 1, pass slipped stitch over stitch worked. Work back and forth on circular needle from mid front, bottom up to armholes. Then work front pieces and back piece back and forth on circular needle separately. Work sleeves in the round on short circular needle/double pointed needles, top down. Cast on 140-148-160-174-186-202 stitches (including 12-12-12-14-14-14 band stitches in each side of piece) on circular needle size 7 mm with 2 strands light grey Brushed Alpaca Silk or 1 strand pearl grey Melody - read STRIPES-1. Work 3 ridges in GARTER STITCH - see explanation above. 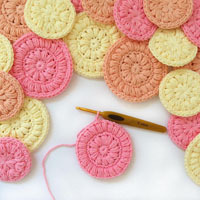 Switch to circular needle size 8 mm. Then work as follows from right side: Work A.1 over the first 12-12-12-14-14-14 stitches (= band stitches), work in stocking stitch until 12-12-12-14-14-14 stitches remain, work A.2 over the last 12-12-12-14-14-14 stitches (= band stitches) - read PATTERN. Insert 1 marker thread each side, 38-40-43-47-50-54 stitches in from mid front (back piece = 64-68-74-80-86-94 stitches). REMEMBER THE KNITTING TENSION! When piece measures 19 cm, decrease 2 stitches at each marker thread (= 4 stitches decreased) - read DECREASE TIP! Decrease like this every 17-18-19-20-21-22 cm 3 times in total = 128-136-148-162-174-190 stitches. When piece measures 57-59-61-63-65-67 cm, work next row as follows from right side: Work the first 33-35-38-42-45-49 stitches, cast off the next 4 stitches for armhole (= 2 stitches on each side of marker thread), work the next 54-58-64-70-76-84 stitches, cast off the next 4 stitches for armhole, work 33-35-38-42-45-49 stitches. Finish each part separately. = 54-58-64-70-76-84 stitches. Continue in stocking stitch as before. When piece measures 75-78-81-84-87-90 cm, cast off the middle 10-10-10-12-12-12 stitches for neck and finish each shoulder separately. Cast off 1 stitch on next row from neck = 21-23-26-28-31-35 stitches. Continue until piece measures 77-80-83-86-89-92 cm and cast off. Work the other shoulder the same way. = 33-35-38-42-45-49 stitches. 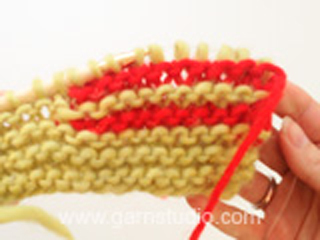 Continue with pattern A.1 over band stitches as before and in stocking stitch over the remaining stitches. When piece measures 77-80-83-86-89-92 cm, cast off the first 21-23-26-28-31-35 stitches from wrong side for shoulder, work the rest of row = 12-12-12-14-14-14 stitches remain on needle for shawl collar. Work short rows in garter stitch over these stitches, begin from right side as follows: Work 1 row over the first 8-8-8-9-9-9 stitches, turn and work back, work 1 row over all stitches, turn and work back. Continue like this until neck edge measures 6-6-6-7-7-7 cm at the shortest. Cast off. Work as right front piece but reversed. I.e. continue pattern A.2 over band stitches, cast off the first 21-23-26-28-31-35 stitches from right side for shoulder and work the short rows over neck edge with beginning from wrong side. 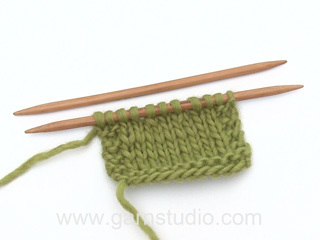 Worked in the round on short circular needle/double pointed needles, switch to double pointed needles when needed. Loosely cast on 48-50-53-55-58-60 stitches on short circular needle size 8 mm with 2 strands off white Brushed Alpaca Silk or 1 strand off white Melody. Work 1 round in stocking stitch. Then work in stocking stitch and STRIPES-2. Insert 1 marker thread at beginning of round = mid under sleeve. When piece measures 3 cm, decrease 1 stitch on each side of marker thread - remember DECREASE TIP (= 2 stitches decreased). Decrease like this every 4-3½-3½-3-2½-2½ cm 10-11-11-12-13-13 times in total = 28-28-31-31-32-34 stitches. 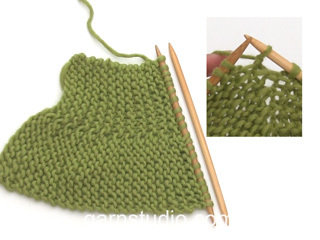 When piece measures 42-41-40-38-37-34 cm (shorter measurements in the larger sizes because of wider shoulders), switch to double pointed needles size 7 mm. Work 3 ridges in GARTER STITCH - see explanation above. Cast off - to avoid a tight cast-off edge you may use a needle 1 size larger. Work the other sleeve the same way. Sew the shoulder seams. Sew shawl collar together mid back (seam mid back should be inwards when collar is folded towards the back). Sew collar to neckline in the back of neck. Sew in sleeves. The jacket has 2 ties. 1 tie= cut 4 strands light grey Brushed Alpaca Silk or 2 strands pearl grey Melody of approx. 1.5 meters. Twine the strands tog until they resist, fold the strands double so that they twine. Tie a knot in one end and tie a knot approx. 10 cm from edge in the other side (the tie should be approx. 50 cm when finished, cut it to correct length). Thread the tie through a wooden bead and tie a knot - make 1 tassel (= cut 16 strands light grey Brushed Alpaca Silk or 8 strands pearl grey Melody of 16 cm) and tie another knot (with the strand from the tie) in the middle of the tassel. Fold the tassel double and tie a knot approx. 1½ cm down from wooden bead, around the tassel. Cut the tassel in bottom edge. Fasten the tie in the left side on the outside of jacket approx. 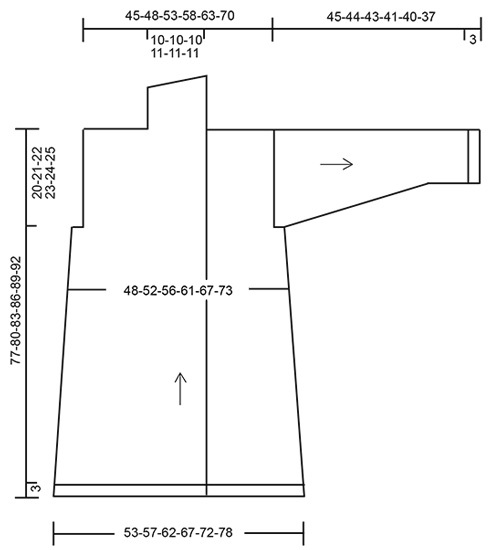 10 cm below armhole (try the jacket on and adjust placement of the tie). Make another tie the same way and fasten it at the edge of band on right front piece approx. 28-29-30-31-32-33 cm from shoulder and down.